OpenDataSoft datasets are accessible by developers through an HTTP REST API. The domain https://examples.opendatasoft.com will be used to illustrate examples given in the following documentation. The available APIs are listed below. The real time push API is very specific and will not be detailed in the following documentation. Please refer to the platform documentation for more information about this API. These APIs support cross-domain access from a browser using CORS. For older browsers or other specific purposes, JSONP is supported when returning JSON content by adding a callback parameter. To access a dataset directly via the dataset lookup API or record related APIs, its identifier must be provided. This identifier is found in the information tab of each dataset. All API endpoints support both GET and POST requests. GET methods are preferred, but POST methods can be used to work around browser, library or proxy limitations regarding the size of HTTP URLs. All API endpoints are protected by the same authentication and authorization model. All API endpoints are available in HTTPS, which use is highly recommended wherever possible. All API endpoints are subject to quota-based limitations. According to the domain configuration, authenticated users may have extended quotas compared to anonymous access. Please contact the domain administrator for more information about a user's quotas. "error": "Too many requests on the domain. Please contact the domain administrator." "error": "You have exceeded the requests limit for anonymous users." When an error occurs, a JSON object describing the error is returned by the API. An authenticated user can be granted access to restricted datasets and benefit from extended quotas for API calls. The API features an authentication mechanism for users to be granted their specific authorizations. API keys are managed via your user profile page at https://<youropendatasoftportal>.com/account/ or by clicking on your name in the header. Go to the tab named My API keys to see your existing API keys, revoke them and create new ones. Every API key authenticates requests as coming from your user, which means they grant the same rights (yours) to any person using them. Therefore, you should not share your keys. API keys are passed along requests through the query parameter apikey. For example, accessing a private portal's catalog unauthenticated will return a 401 Unauthorized error. But passing the API key of an authorized user will return the JSON response with the list of accessible datasets for this user on the portal. 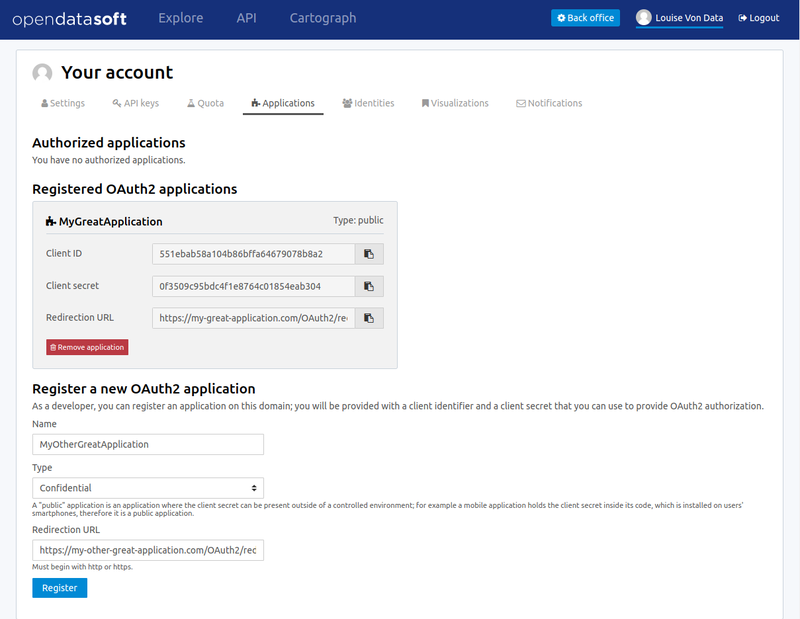 OpenDataSoft implements the OAuth2 authorization flow, allowing third party application makers to access the data hosted on an OpenDataSoft platform on behalf of a user while never having to deal with a password, thus avoiding any user credential to be compromised. The OpenDataSoft OAuth2 authorization flow is compliant with RFC 6749 and makes use of Bearer Tokens in compliance with RFC 6750. Application developers who want to use the OpenDataSoft APIs with OAuth2 must go through the following steps, which will be explained in this section. Register their application with the OpenDataSoft platform. Request approval from users via an OAuth2 authorization grant. 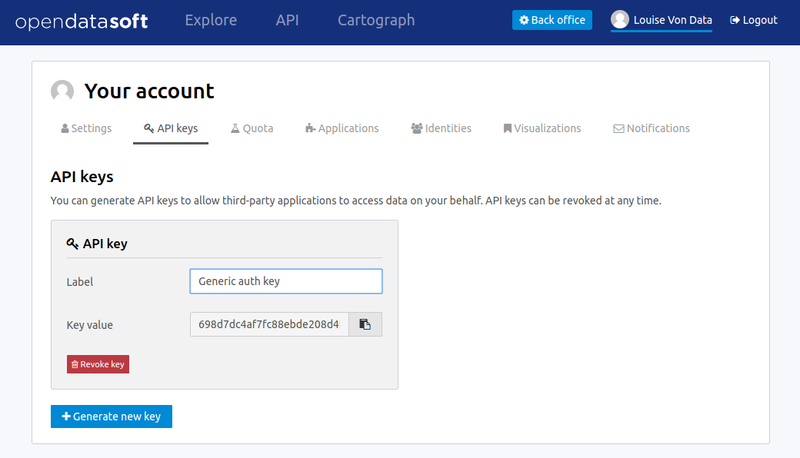 Request a bearer token that will allows them to query the OpenDataSoft platform APIs for a limited amount of time. Refresh the Bearer Token when it expires. Currently, applications are registered on a specific domain and can only access data on this domain. Go to the My applications tab of your account page on the domain you want to register the application on. Store the resulting client ID and client secret that will be needed to perform the next steps. Redirect them to /oauth2/authorize/ with the appropriate query parameters. The user will then be authenticated in the platform and redirected to a page identifying your application. From there, the user will review the information you filled in the form described above and the scope of the requested access, and grant your application the right to access their data. Once the user has accepted those terms, they will be redirected to your application's redirection URL with query parameters describing your authorization grant. The 30-character authorization code must now be converted into a bearer token within 1 hour before expiring. access_token: the token you can use to access the user's data. The response to this request is identical to the bearer token response. Filtering features are built in the core of OpenDataSoft API engine. Many of the previously listed APIs can take as a parameter filters for constraining the list of returned datasets or records. Note that a given filtering context can simply be copied from one API to another. For example, you can easily build a user interface which first allows the user to visually select the records their are interested in, using full text search, facets and geo filtering, and then allowing them to download these records with the same filtering context. The OpenDataSoft query language makes it possible to express complex boolean conditions as a filtering context. The user query can most of the time be expressed through the q HTTP parameter. q=film -> results that contain film, films, filmography, etc. q="film" -> results containing exactly film. The query language accepts full text queries. If a given word or compounds is surrounded with double quotes, only exact matches are returned (modulo an accent and case insensitive match). The query language supports the following boolean operators AND, OR and NOT. One of the major feature of the query language is to allow per field filtering. You can use field names as a prefix to your queries to filter the results based on a specific field's value. The domain administrator might define a richer metadata template, thus giving access to a richer set of filtering fields. For the record search API, the list of available fields depends on the schema of the dataset. To fetch the list of available fields for a given dataset, you may use the search dataset or lookup dataset APIs. Advanced functions can be used in the query language. Function names need to be prefixed with a sharp (#) sign. years, months, weeks, days, hours, minutes, seconds, microseconds: these parameters add time to the current date. year, month, day, hour, minute, second, microsecond: can also be used to specify an absolute date. weekday: Specifies a day of the week. This parameter accepts either an integer between 0 and 6 (where 0 is Monday and 6 is Sunday) or the first two letters of the day (in English) followed by the cardinal of the first week on which to start the query. Records search APIs accept geofilter parameters to filter in records which are located in a specific geographical area. The following parameters may be used. A facet can be considered as a valued tag associated with a record. For instance, let's say a dataset has a facet "City". A record in this dataset could have the value "Paris" for the "City" facet. Facets are for instance used for building the left navigation column, both for dataset catalog exploration page and dataset records exploration page. Facets are especially useful to implement guided navigation in large result sets. By default, in dataset and record APIs, faceting is disabled. Faceting can be enabled by using the "facet" API parameter, specifying the name of the facet to retrieve. In the records API, facets are defined at field level. A field facet can be available depending on the data producer choices. Fields (retrieved for instance from the Dataset Lookup API) for which faceting is available can be easily identified as shown in the example on the right. When faceting is enabled, facets are returned in the response after the result set. Every facet has a display value ("name" attribute) and a refine property ("path" attribute) which can be used to alter the query context. Facets are hierarchical, for instance, a year facet will contain months facets and a month facet will contain days facets. Refining on the facet "modified"
It is possible to limit the result set by refining on a given facet value. To do so, use the following API parameter: refine.FACETNAME=FACETVALUE. In the returned result set, only the datasets modified in 2013 will be returned. As the refinement occurs on the "year" and as the "modified" facet is hierarchical, the sub-level is returned. Results are dispatched in the "month" sub value. Using the same principle as above, it is possible to exclude from the result set the hits matching a given value of a given facet. To do so, use the following API parameter: exclude.FACETNAME=FACETVALUE. Only results that have not been modified in 2011 will be returned. By default, faceting is conjunctive. This means that the following context will lead down to no results: https://public.opendatasoft.com/api/datasets/1.0/search?refine.modified=2013&refine.modified=2014. You can enable disjunctive faceting using the following API parameter: disjunctive.FACETNAME=true. This API provides a search facility in the dataset catalog. Full text search as well as multi-criteria field queries are made possible and results facetting is provided as well. rows Number of results to return in a single call. By default, 10 results are returned. While you can request for up to 10 000 results in a row, such requests are not optimal and can be throttled so you should consider splitting them into smaller ones. This API makes it possible to fetch an individual dataset information. The dataset identifier is passed as a part of the URL as indicated by the <dataset_id> placeholder in the example on the right. This API makes it possible to perform complex queries on the records of a dataset, such as full-text search or geo filtering. It also provides faceted search features on dataset records. rows Number of results to return in a single call. By default, 10 results are returned. While you can request for up to 10 000 results in a row, such requests are not optimal and can be throttled so you should consider splitting them into smaller ones or use the Records Download API. Note also that the cumulated value of the parameters start and rows cannot go over 10 000. It means that with the Records Search API, there's no way to access a result with a position greater than 10 000. If however you need to do so, consider again using the Records Download API. This API makes it possible to fetch an individual record using its identifier (Record ID). This API provides powerful analytics features over a set of selected records. It returns analyzed results in light and easy to parse format which can used as an input of modern charting libraries such as Highchart.js or D3.js. y.<SERIE>.expr Defines the value to be aggregated. This parameter is mandatory for every aggregation function but the COUNT function. The parameter must have the same name as the one used for the required corresponding aggregation function. The parameter may contain the name of a numeric field in the Dataset (Int or Double), or a mathematical expression (see below to get more details on the expression language). An arbitrary expression can be used as the value of the definition of an aggregated. This API provides an efficient way to download a large set of records out of a dataset. The HTTP answer is streamed which makes it possible to optimize the memory consumption client side. This API provides powerful geo clustering features over a set of selected records. The return format can easily be used to build comprehensive data visualizations on a map, using a very large number of records. It returns a list of clusters with the number of points contained in each cluster and the polygon of the cluster envelope, along with computed aggregations when required. The clustering results are returned in JSON.